The rosa rugosa goes by many names. Its name literally translates to “wrinkled rose”, but the species is most commonly referred to as apple rose, Ramanas rose, Saltspray rose or Japanese rose. Rosa rugosa is a deciduous shrub native to eastern Asia and parts of Siberia, where it mainly grows on coastal sand dunes. This seaside plant makes very prickly, dense thickets with handsome green foliage that will turn a bright yellow before being shed in the autumn. 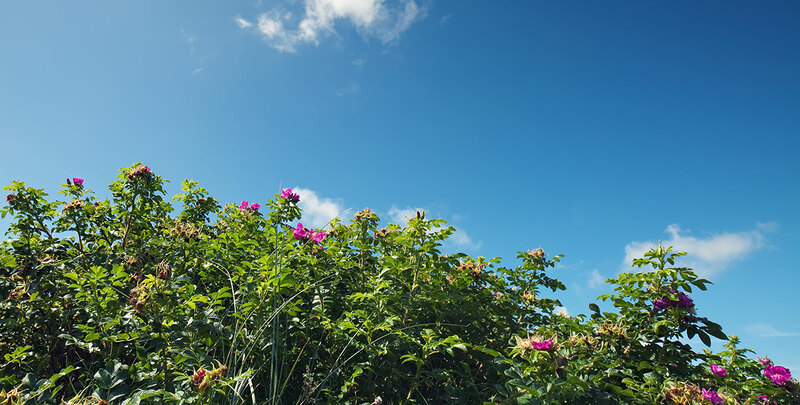 Due to the density of its growth, as well as its thorns, rosa rugosa makes excellent intruder and security hedges, though a rosa rugosa hedge is beautiful enough to plant in your garden for other reasons than keeping burglars and unwanted animals out. Rosa rugosa provides interest in numerous ways throughout the year. 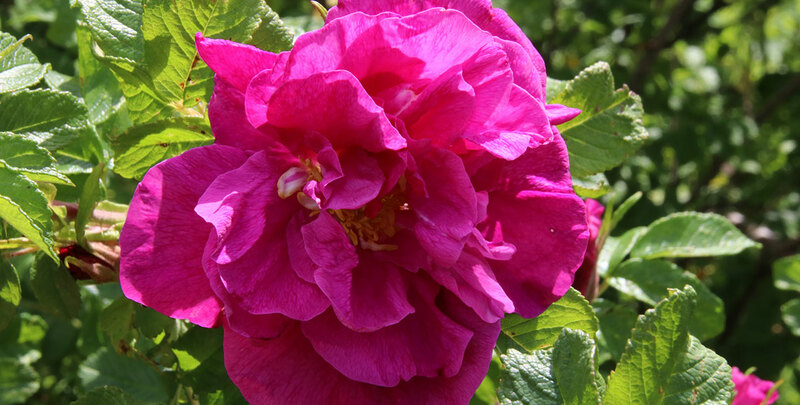 The species flowers in the summer, from June to September, with magnificent deep pink, five-petalled flowers, which makes rosa rugosa easily identifiable as part of the rosa genus. The flowers have a very strong, pleasant scent. If planted in a row, rosa rugosa will create a lovely summer hedge. After flowering, it produces conspicuous red rosehips. The enormous fruits, which resemble cherry tomatoes and are very rich in vitamin C, definitely set this species of rose apart from other roses. It is possible to eat these fruits right off the plant, but they are even better when made into a jam or syrup. Their taste resembles the taste of plums. The fruits of the rosa rugosa have been appreciated by humans and birds alike for a long time. In fact, this species has been cultivated in China and Japan for about a thousand years. And not just because of its immense ornamental value: its fragrant flowers are used to make potpourri and the plant has been used to treat gastritis and irregular menstruation in traditional Chinese medicine. 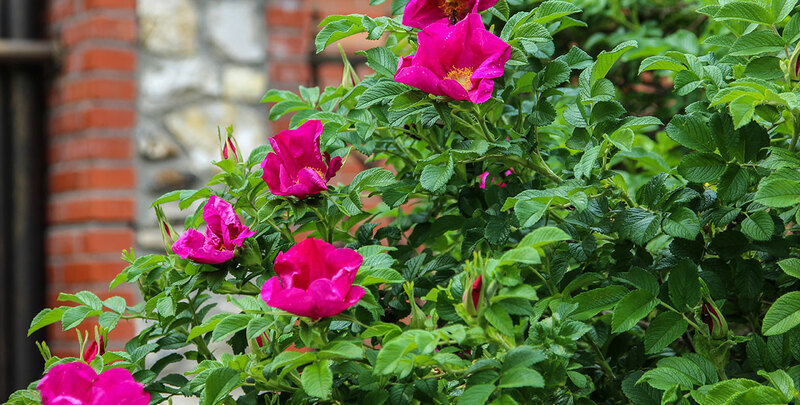 In addition, its resistance to diseases like rose black spot and rose rust makes the rosa rugosa the ultimate proof that strength and beauty can go hand in hand. As a result, numerous cultivars have been established all over the world. Rosa rugosa has also begun to establish itself as a hedging plant. Rose breeders have even developed hybrids with other roses in order to create even more beautiful colour combinations. Wildlife will certainly also appreciate a garden with a rosa rugosa hedge. 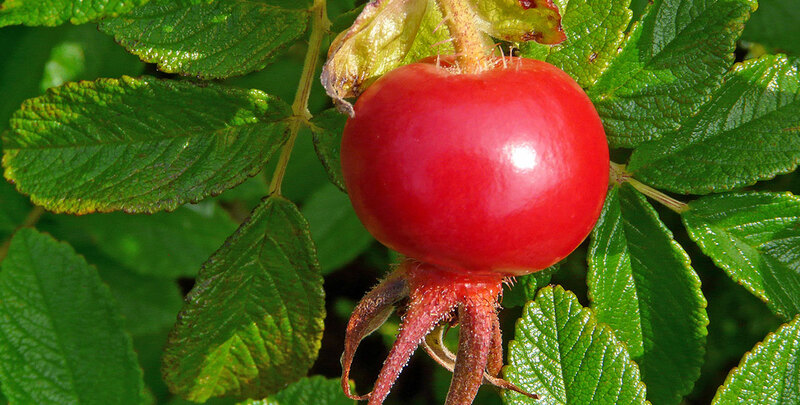 Birds like to eat the rosehips, but also use its thorny branches to keep their nests safe from cats and other predators, while bees and butterflies are attracted to the summer flowers of the rosa rugosa. Therefore, when you plant a rosa rugosa hedge, you can look forward to having a lively garden throughout the entire year. However, it can also be useful as a security hedge, as its vicious thorns form a natural barrier between your garden and the outside world and will certainly discourage burglars and animal intruders from entering your garden, while the shrub’s thickness during springtime and in the summer make it an ideal specimen for a privacy hedge. Rosa rugosa hedges grow densely and are not easily tamed. This type of hedge can be trimmed to look a little neater, but it will always look at least a little bushy. As a result, a rosa rugosa hedge will always have a somewhat informal appearance. Trimming can take place in the spring, preferably around March. The thorny branches of the species do not exactly make pruning an easy job, but since it is fairly tolerant of pruning, it should not be too much of a problem if you use gloves and protective clothing. Rosa rugosa has a fairly average growth rate of around 20 to 30 centimetres per year and can grow up to about 2 metres in height. Despite the fact that rosa rugosa is considered a typical seaside plant, it is suitable for all well-drained soils. Obviously, sandy soils are ideal, but it should thrive in almost any soil. In fact, you should not even have to apply a lot of fertiliser, unless the spot you plant your rosa rugosa hedge has exceptionally poor soil. Keep in mind that rosa rugosa tends to be quite invasive, particularly in sandy conditions. Some sun is beneficial to the rosa rugosa, deep shade less so. Rosa rugosa hedges are tough and not susceptible to diseases, while also being hardy during severe winters. It is important that you trim old growth and twigs in the early spring. A rosa rugosa hedge is best planted during the autumn. Rosa rugosa is a strong, tough and undemanding plant that does not require a lot of maintenance and will thrive under most conditions. Therefore, rosa rugosa hedges are recommended to beginning and advanced gardeners alike. You do not have to do a lot of hard work in order to enjoy the elegant, fragrant flowers and the beautiful, big rosehips of this species. Wildlife that is attracted to your rosa rugosa hedge will make your garden even more vibrant than the colours of this type of rose hedge undoubtedly already will. Its strong thorns will furthermore discourage uninvited guests from setting foot in your garden. A rosa rugosa hedge is easy, yet very rewarding to grow. If you will give your hedge the little attention that it requires, it will display all of its amazing colours – including its beautiful autumn colouring – on a yearly basis. And that is not all, as its sizeable, healthy fruits are a tasty treat to humans and birds.